Swift is the new programming language from Apple announced at WWDC 2014. As of September 9, 2014, you can now submit apps that use Swift to the App Store. In my copious free time, I’ve been getting both my hands dirty and my feet wet with Swift on several projects. Here I’ll show you how straightforward it is to use ProximityKit for iOS with Swift. 1- In order to use Swift, you need to install and run Xcode 6 or newer. 2- Create a new iOS Single View Application project. 3- We’ll call ours “SwiftBeacon”. Make sure you select “Swift” in the Language menu. 4- Close the project window as we’re going to use CocoaPods to include ProximityKit in the app. 8- Now open the .xcworkspace file for your project going forward so that the ProximityKit CocoaPod is automatically included. At this point, you should be able to build and run this app on your phone. It’d be a good idea to do this right now, just to be sure you’ve done everything properly up to this point. On my phone, the app simply displays a white screen. We now have a project containing some Swift code and the ProximityKit framework. But the app is written in Swift and ProximityKit is written in Objective-C! How will we bridge that gap? 1- Create a new header file named <project_name>-Bridging-Header.h. 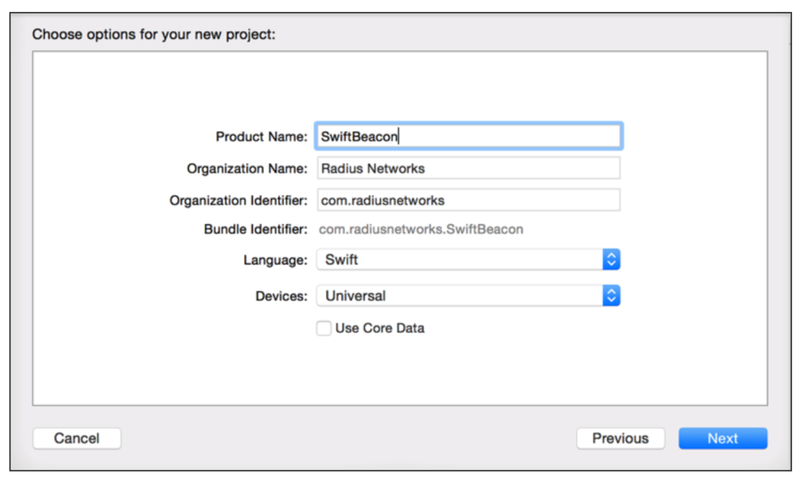 In our case, we’re calling it SwiftBeacon-Bridging-Header.h. You need not add this to any target since it’s a simple header file. 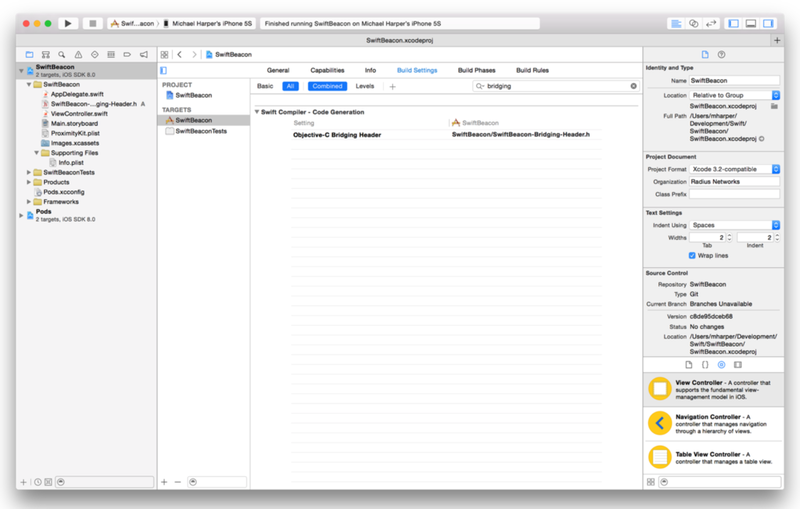 2- #import the ProximityKit header file in the bridging header file. You can include any other header files here for Objective-C items you need to access from your Swift code. Once again, build and run your app to make sure you’ve setup your bridging header file properly. All of the puzzle pieces are now in place so that we can hook up the app to ProximityKit. Implement the RPKManagerDelegate methods as necessary. Build and run once again. ProximityKit automatically requests authorization for location monitoring on the behalf of your app but only if the key in your Info.plist file is properly setup. Assuming you are in the vicinity of beacon(s) that are in your kit, you should see log messages in your debug console indicating what’s going on with ProximityKit. GitHub repository for this example. The Swift Programming Language book from Apple.